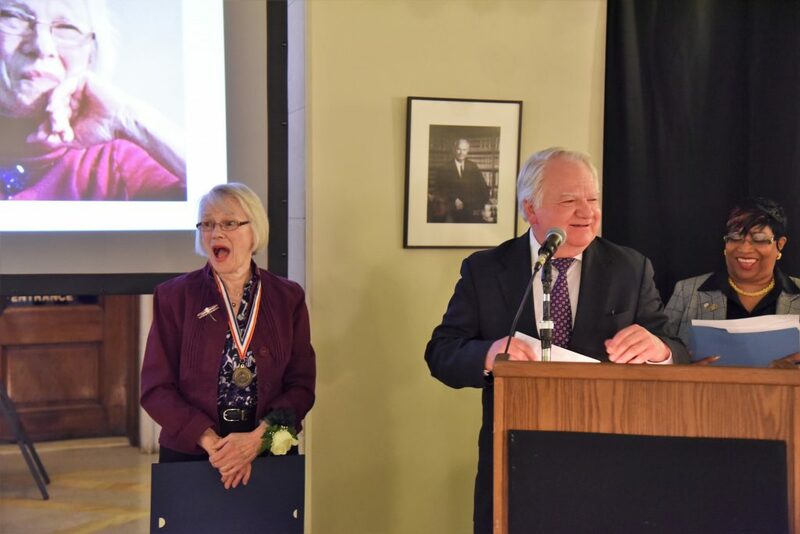 Thirteen women were honored at the annual Hudson County Women's History Month ceremony. Photo by Art Schwartz. Aimee Focaraccio was honored for her work with NB C.A.R.E.S. Photo by Art Schwartz. Weehawken's Evelyn Detti was honored for her work with Weehawken Citizens for Peace. Photo by Art Schwartz. HCDO Chairwoman Amy DeGise was a keynote speaker at the ceremony. Guttenberg's Rose Gunther has a lot to celebrate along with her 100th birthday. Photo by Art Schwartz. 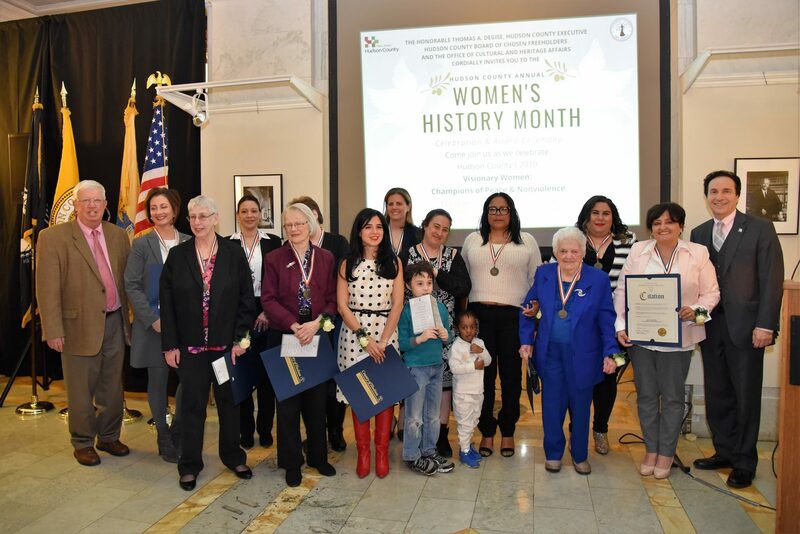 Hudson County held its annual awards ceremony for Women’s History Month to honor the achievements of county residents. They were honored at the Historic Brennan Courthouse in Jersey City on March 19. This year’s theme focused on women who’ve advocated for peace and nonviolence, though other causes were also highlighted. 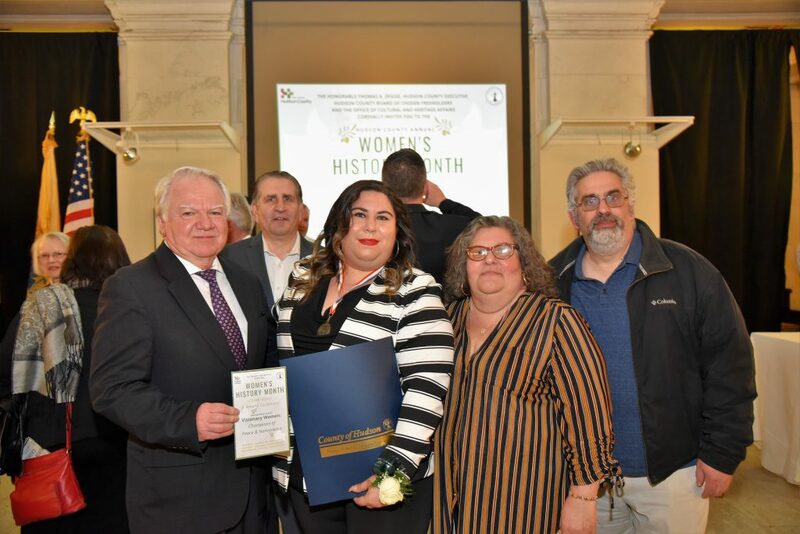 The event was hosted by the Hudson County Board of Chosen Freeholders, and members of the 2019 Hudson County Women’s History Month Committee. The recipient of a Champion of Peace award went to Griselda Joynt, a Bayonne police officer who began her career in 1994 as a 911 dispatch operator. She became a police officer in 1998, where she worked in the patrol division for eight years, and the DARE program for six years. She was a school resource officer for almost seven years. She’s currently assigned to the Juvenile Detective Bureau, and assists with the Bayonne Police Explorer Post 227, a community policing program that mentors at-risk youth throughout the city, and works extensively with youth through community policing programs. She’s received numerous merits from the Bayonne Police Department, including a commendation, three excellent police service awards, a meritorious police citation, and a meritorious unit citation. She received the 2008 Police Woman of the Year award from the Bayonne Hispanic Association of NJ, and the 2016 Award of Generosity and Dedicated Service to the Community by the Hispano Americano de Bayonne. She worked as a bookkeeper and secretary at a local yarn mill, and eventually went on to open Gunther’s Corner Clothing Store at the corner of 68th Street and Park Avenue. She’s a community institution, retiring in 2011 at the age of 93. Today, Gunther still owns and manages various real estate properties. Gunter was told that the Women’s History event on March 19 was a tribute to Mayor Wayne Zitt. She was surprised to find out when she arrived that she was the town’s honoree. The Jersey City Game Changer Awards were given to four local women this year. Colleen Salvatore, a lifelong Jersey City resident, is known for her advocacy in helping special needs children at a local level. Through her role in Jersey City’s public education system, she helped mitigate the barriers to resources for children, and improved access to special needs programming and support. She’s a member of the Special Education Parent Advisory Council. Hessie Williams was honored for organizing the group “A Mother’s Pain.” Following the loss of her son in a fatal 2016 shooting, she established the support group for grieving mothers, who take a stance against violence at a grassroots level. Lynn Hazan is the founder of ChicpeaJC.com, a culture blog focused on Jersey City and Hudson County. The blog promotes local initiatives to support small businesses and the creative community. She also founded the Content Creators Academy, a mentoring program for local youth interested in entrepreneurship in the digital media field. Amy Albert has an extensive legal career dedicated to the challenges of poverty and systemic inequality among children. She represents homeless youth at Covenant House, a crisis center for children. She is also a founding coordinator of Brooklyn Defender Services’ Brooklyn Adolescent Representation Team, and served as a Conciliation Specialist for the U.S. Department of Justice’s Community Relations Service. Albert is also the founder of Haven Adolescent Community Respite Center, a Jersey City–based nonprofit that works with at-risk youth as an alternative to homelessness or incarceration. It offers residential care and social services to minors who’ve suffered from abuse, neglect, abandonment, homelessness, and human trafficking. The nonprofit has helped more than 300 Hudson County locals in its first three years as a Hudson County branch. Aimee Focaraccio, a 31-year-old lifetime North Bergen Resident, is the coordinator of NB C.A.R.E.S. (Community Assistance Relief Events and Support). She runs drives and giveaway events in North Bergen, and runs a relief center to assist fire victims. She’s a trustee for the Nicholas J. Sacco Foundation, the community services director for the Hudson County Young Democrats, the national committeewoman for the NJ Young Democrats, and the deputy finance director for the Young Democrats of America. Two Hoboken women were given awards for their entrepreneurial work. Grace Scianalepore manages Leo’s Grandevous, one of Hoboken’s legendary restaurants. She took over the GM position of the family business in 2016, after the longtime establishment began stagnating financially. The restaurant, founded by Scianalepore’s grandfather, has seen increased margins and sales, and has become known internationally through both local news and national television. 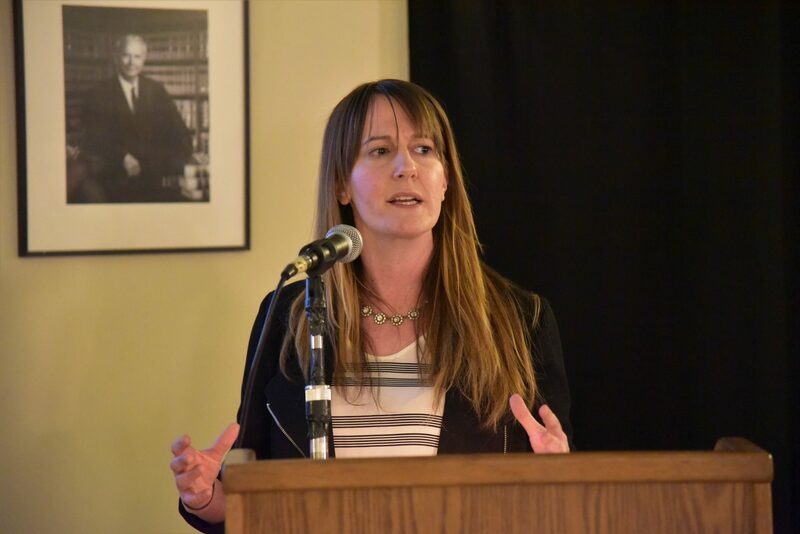 Nadja K. Rutkowski, a senior vice president of sales at Terry Steiner International, is also a member of Hoboken’s CERT (Community Emergency Response Team), which trains residents in basic disaster response skills. CERT members assist others in the neighborhood or workplace during disasters before first responders arrive, and are involved in community emergency preparedness efforts. She was born and raised in Berlin at the height of the Cold War before moving to the United States. Secaucus resident Anuja Singh, a customer experience business development representative with Cisco systems, was honored for her passion for inclusion, diversity, and mentorship in the STEM field. She co-founded Cisco Empowered Women’s Network, which has 3,000 members globally. She is a public speaker who focuses on technical and leadership topics, and volunteers with high school student-shadowing programs. She also chronicled her experience as a breast cancer survivor at theanujaksingh.wordpress.com to help others as they face their own struggles. Liliana Ines Barrera is a set designer and line producer, with a long history in both film and television productions. She also served as a producer on the local program, HudsonTV19. Barrera is Union City’s special events coordinator, overseeing all events at the William V. Musto Cultural Center. She also serves as a technical director and acting teacher for the Grace Theatre Workshop, a nonprofit group that provides free performing arts instruction to local children. 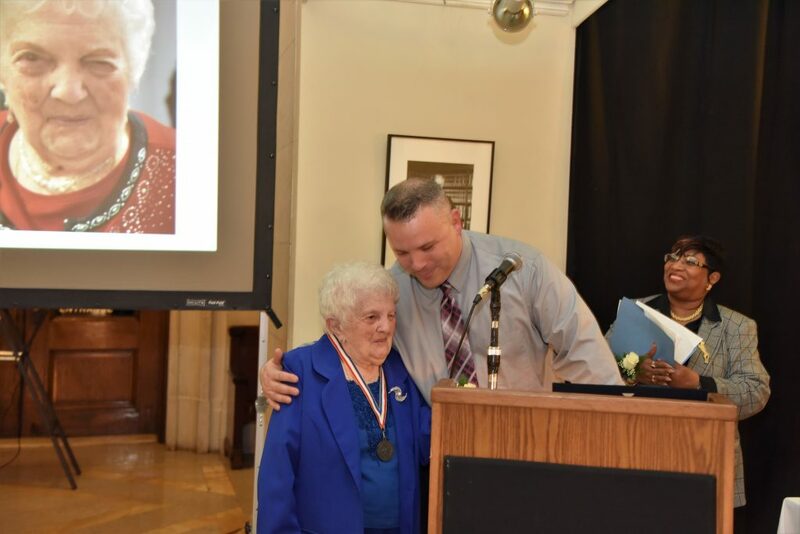 Evelyn Detti, a Weehawken resident, was honored for her commitment to Weehawken’s Citizens for Peace, a group that’s held monthly peace vigils since 2004 to honor veterans, and all who are affected by war. The group holds a staunchly anti-war position, no matter the cause. Throughout the 1970s and ’80s, Detti was a member of the Parent-Teacher Council and the Weehawken Environmental Committee. Ann Bridget Briordy is a lifelong West New York resident, known for her role as Mrs. Santa Claus in the annual Christmas celebrations in town. She is a frequent volunteer at events run by the Cultural Affairs Department, and is an 18-year town employee. She also provides food to low-income families through her time spent at the local Jesus Family Church, and is a 30-year member of the Women of the Moose for Moose Lodge 810, where she continues to engage in charitable efforts. For updates on this and more stories keep checking hudsonreporter.com or follow us on Twitter @hudson_reporter. Mike Montemarano can be reached at mikem@hudsonreporter.com.